The chairman of Hyundai Motor Group, Chung Mong-Koo, arrested in South Korea early this year on embezzlement charges has escaped jail ... for cash. Chung and three other Hyundai Motor executives were accused of setting aside 103.4 billion won without proper accounting and of using 69.6 billion won for illegal political donations, undeclared employee bonuses and to attract an international expo to the city of Yeosu. There were also charges of manipulating share prices of an affiliate to benefit the Chung family, which founded the conglomerate. He was found guilty of all charges by a lower court. The verdict was appealed and now the appeal court has ruled that his imprisonment would badly damage South Korea's economy, so it was better to let him go free. Chung was allowed to go free on the promise of restitution, to be paid by building a concert hall and opera house in Seoul and 12 cultural centers in other provinces over the next seven years. The suspension of a three-year prison sentence for Chung Mong Koo, convicted of embezzlement in February, if he donates $1 billion to charity, is the latest and most dramatic example of a uniquely Korean form of justice. South Korea has an unusual system of justice. The ultra rich pay large sums of money to a variety of causes that “aid society,” and are able to escape jail terms because they are too important for the national economy. 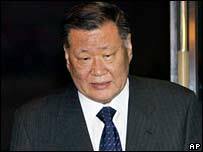 Chung is Korea’s second-richest man and heads Hyundai, which appeared to be sliding down and losing customers until the court freed him. The logic is that now he can have more time to concentrate on winning customers from Toyota Motor Corp. and Honda Motor Co., Hyundai's rival competitors. It was not immediately clear if prosecutors planned to appeal to the supreme court. South Korea continues to be an ethically-challenged place to conduct business. I'm just surprised they didn't wait until Buddah's birthday to actually pardon him... maybe that's next!